Recently, I was asked "how are you?" on the phone. I immediately replied "Fine, thank you. And you?" After saying this, I felt very strange because I knew I was not fine. I replied, "Fine, thank you" even though I was sick. This was something like conditioned response because I practiced the following English Conversation so many times when I was a little student in Japan. "Fine, thank you. ( And you?)" Now I have to tell you, because of this recitition in the past, it's still hard for me to answer "how are you?" differently. I'm afraid I might say "Fine, thank you," even when I were dying. Anyway, fortunately or unfortunately, I had been sick since last Saturday. As soon as I confirmed no students coming here, I felt extremely tired and cold. I started to sleep without having meal and headache continued till Tuesday and now I feel myself recovered completely. I was not happy for my condition but I thought it was a good timing I caught a cold while no event was being held. 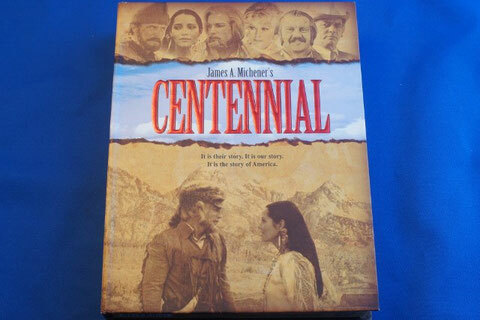 Another good thing was, I was finally able to watch the long stories of American Drama, titled "Centennial," which I bought DVDs about a year ago. It was kind of my dream to watch it because I needed lots of free time to complete watching all 12 stories. The TV miniseries Centennial was translated and broadcasted in Japan, too, in 1980's. The Japanese title of this Centennial was, "Haruka-naru Seibu; Waga machi Centennial" meaning "Faraway Western; My hometown Centennial." It is multiple stories occured at fictinal town called "Centennial", Colorado based on the Amierican history during the past 200 years since 18th Century to the late 20th century. Surprisingly, I still remember the day of the Centennial was broadcasted in Japan. I was 10 years old when I watched it. On that day, my family was going to the trip for skiing. But I had a terrible cold. So my mother stayed with me at home and my brother and sister went trip with my father. In the beginning, I was so sad I was sick. I was looking forward to the trip. But after watching the Centennial, I thought I was lucky to be sick. I guess my mother had a same feeling since she has told me many times about how impressive the Centennial was. Still today, she mentions this. The Centennial gave me deep impression and even shocking , too, when I was 10 years old. And this time, it gave me an opportunity to think of the history which consists of countless untold stories of various people.